Over the past several years I have witnessed New England communities grapple with challenges that are likely indicators of our changing climate. The sea is creeping into parking lots at high tide in low-lying Rhode Island. The Cape Cod National Seashore rebuilds access to beaches as the sea eats away dunes that have loomed for centuries. After Tropical Storm Irene, we saw Vermont communities helping each other and their state recover from the damage. I’m proud that our office has just launched an online resource to further help New England communities navigate how to respond to climate change. 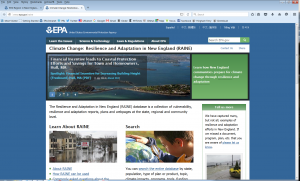 This resource, called RAINE (it stands for “Resilience and Adaptation in New England,”) is full of links, documents and information on how more than 100 New England communities are taking action to adapt to climate change. When a town in Southern New England faces flooding, it can check the database and find guidance from Vermont’s experience after Tropical Storm Irene. When a beach community wants to find out how it can provide economic incentives to homeowners to provide extra protection for flooding they can look to Hull, Massachusetts. Hull provides a rebate on building department fees for homeowners who increase their building height above the base flood elevation. Users can see how communities are working with local businesses to adapt, such as in Misquamicut Beach Rhode Island, where businesses that were swept away by Superstorm Sandy are now rebuilding so they can get out of the way if another storm surge threatens them. Becoming more “resilient” takes effort and forethought. Our communities need leaders who guide us to make investments today that will help us be more resilient tomorrow. The bottom line is, resilience is about people taking action to prepare wisely for the future. The RAINE database helps communities share what they have learned about adjusting to our changing climate, so that other communities can gain from their experience. On the heels of the Paris climate agreement, with more than 190 countries coming together to reduce emissions in order to lessen the impacts of climate change, our RAINE database is further evidence that what is global is also local. New England communities are leading the way, learning from each other, connecting, and working together to address the impacts we are facing. I may be biased, but it seems to me that New England communities are often leaders when it comes to protecting and living sustainably in our environment. With RAINE, each community isn’t on their own to reinvent the wheel. We welcome New England’s community leaders to use the RAINE database to learn what others are doing, and we invite you to share your experiences with other local decision makers. We can learn from each other as we tackle the challenges of a changing climate.